First let’s catch up on the mid-week action. Cast your thoughts back to that stiflingly hot Wednesday night two weeks ago and the July Handicap. Jim Laidlaw was first to finish followed by Krzysztof Zielinski who recorded the biggest improvement and maximum points in the Handicap competition. Roy Bentley and Martin Steadman took second and third respectively. So with seven rounds complete Jim Laidlaw continues to lead the annual competition but it is tighter than it looks at the top as Jim is the only runner with the seven maximum counting scores. There are a number of runners close behind with four, five or six runs who only need to run once more to be right in the mix. Plus there are still five more opportunities to score so thirty members could still potentially challenge for the 2017 Handicap title. Last Tuesday saw the Dinton Pastures Relay on a night of downpours at the scenic lakeside park near Winersh. A weather-resistant team of six SJs combined well in monsoon-like conditions as they did their best to match their predicted time for the 4,051m course. Team Manager for the Night Richard Boese made good use of his umbrella as he tried to make sense of the results. Most SJs exceeded their expectations and beat their predicted times which was understandable with conditions encouraging a fast finish. Last Wednesday saw Race 2 in the Yateley Road Race Series. A little warmer than June but still lots of great results with Mike Guess winning the M60 category, Collette Callanan taking second in the F45 race while Dave O’Toole and yours truly took third place in the M60 and M40 categories respectively. Lots of PBs too including (but not limited to) Jacq Hudson, Stuart Mayes and Sharon Burfield. Members were out in force helping at the event and marshaling key points to keep all the runners safe. All three local Parkruns were open again this weekend. Over at Frimley Lodge Jim Laidlaw was first member to finish as he logged a new PB in 20:18. 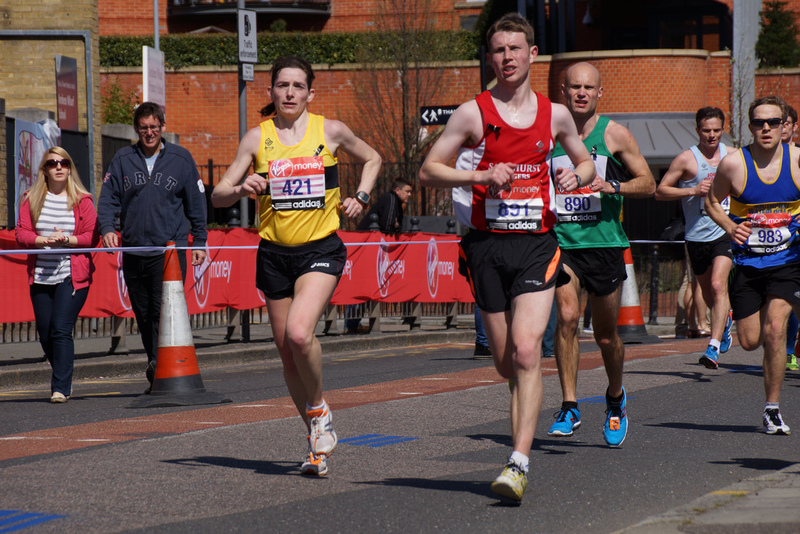 At Rushmoor Jon Gubb had a storming run to record a new PB of 19:28 as he led home three members. Twelve SJs in action at Bracknell making it the best supported with Martin Steadman the first member to finish in 22:53. Loads of Parkrun tourism this week with John King running at Reading, Lisa Hale at Whiteley near Southampton, Dave Ayling at Andover, Sharon Conquer at Northampton John Tovell at home venue Crane Park. Big shout for Stephen Casey who logged a new overall Parkrun PB at Woking with 21:01. Angela Foker ran the Pretty Muddy race at Prospect Park in Reading. The Harry Hawkes 10 Mile was run off on a course that started and finished in Thames Ditton, passing close to Kingston, around Hampton Court Park before crossing the line in Giggs Green near Thames Ditton Cricket Club. Jane Bannister, Jim laidlaw, Hannah Glaister and Caroline Cutliffe all enjoyed great runs. Neil Praine was back in northern action tackling the 36km Man vs Lakes on a very hilly course in… yes you guessed it… the Lake District. Lisa Hale was back on top of the Strava Leaderboard with a total of 65.8km. Marathon preparee Andrew Brooks took second with 57.8km and Neil Praine was third with 57.2km showing good recovery from The Wall Ultra. Sixty-eight members logged runs this week. To take part in this just create a free Strava account and link it to the club in your profile. Tuesday: There will be multiple groups running on Tuesday from Sandhurst Memorial Park this week starting at 6:30pm. Later the interval sessions will meet at The TYTHINGS in Yateley at 8pm . Wednesday: Sharon Burfield and/or Andrea Vincent will be leading a great run of between five to six miles from Sandhurst Memorial Park departing at 7pm. It’s also the final round of the Woodland 5 race series in Crowthorne Woods so there will be plenty of members racing and potentially a troop of support runners heading over there for the 7:30pm start. · 2 relays (4 x 100m, 4 x 400m).